A familiar Sunnyside corner is doing away with its past and introducing itself as a brand new restaurant and concept. 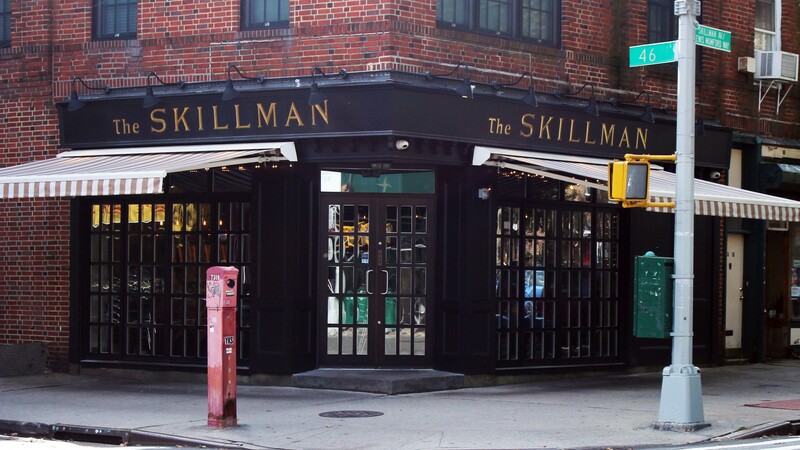 The Skillman, an American bistro, is now the name of what used to be The Dog and Duck on 45-20 Skillman Ave. The restaurant touts a new look and feel since undergoing a change of ownership earlier this year, with the latest of the fixes coming days ago—gold and white awnings with gold lettering to match. 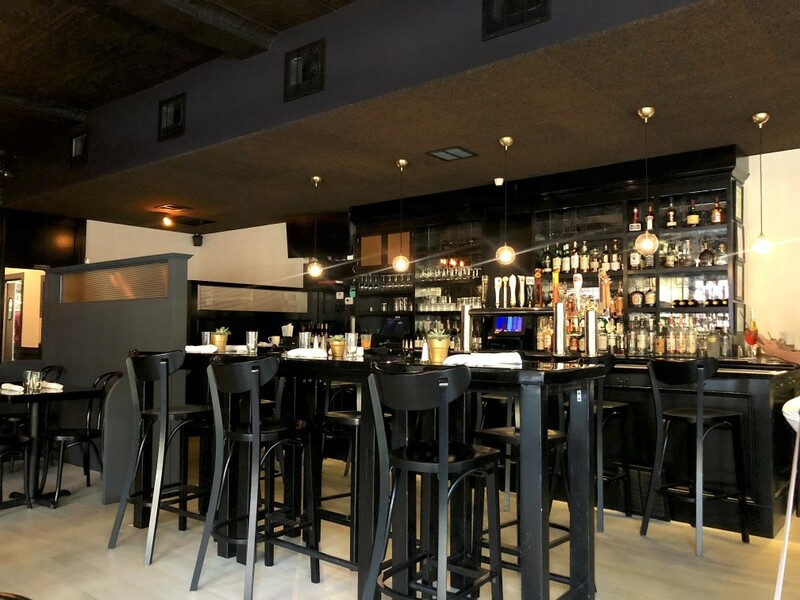 New owners, John Fitzpatrick, Michael Coyle, and James Dolan, took over the location in April, and introduced a transitional menu at the time as they worked to revamp the site with new fixtures, decorations, and updated furniture. Now, The Skillman boasts a seasonal food and drinks menu, offering a smaller number of dishes all made with fresh ingredients for lunch and dinner and envisioned by a new chef, Ryan Kerr. Kerr, who was raised in South Carolina, learned how to cook in the town of Columbia where his love of southern cuisine first developed. He then traveled and worked in kitchens across the globe, alongside many acclaimed chefs. “I cooked over 10 years in the south, then went to cook in Tuscany for a year, worked in the South of France at Château de Lignan for some time, spent a year cooking in Spain, and then arrived at New York City in 2013,” he shared. After returning to the United States, Kerr started cooking in New York as a chef de cuisine under Bobby Flay at Bar American. Afterward, he spent a year cooking under Daniel Humm at The NoMad and Eleven Madison Park. In 2017, Eleven Madison Park was ranked the best restaurant in the world, according to S. Pellegrino’s World’s 50 Best Restaurants list. “I even had an opportunity to work with Michelin-star Chef Jason Atherton at The Clocktower at 5 Madison Ave., so I’m excited to bring all my years of experience and culinary exploration to The Skillman,” Kerr added. The relaunch includes a new menu that will be expanded upon after Sunnyside Restaurant Week, said General Manager Gary Wiley. Stand-out options that are currently available include the pan seared scallops over summer succotash in smoked tomato butter, and the roasted chicken served with mashed potatoes, sweet peas, and chicken jus. In addition, The Skillman Burger, made with pickled red onion, white cheddar, and house sauce on a sesame bun, is already a favorite, Wiley added. 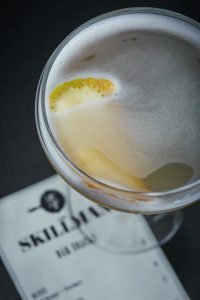 Cocktail favorites include the “Skillman-ade”, made with Tito’s Handmade Vodka, Peach Schnapps, and lemonade, and the “Aperol Spritz”, prepared with Aperol, Prosecco, and club soda. “We were very emphatic in the beginning that we were going to bring a chef in here with imagination and creativity to create a menu that suited the area and clientele,” Fitzpatrick said. The co-owners are aiming for the bistro to be a staple in the neighborhood, with its new name evoking a mainstay feel. For more information, follow The Skillman online at TheSkillman.nyc, and on Instagram and Facebook. To see their full brunch, lunch, dinner and cocktail menu (updated seasonally), visit their website by clicking here. “Now that’s a tasty burger” – stopped by last night and enjoyed the burger and the beet salad. Attentive service and good atmosphere. I once dug my spoon into a Dog and Duck pot pie and pulled out a horse fly. The food bar was mediocre here for years, but so far I’m impressed with the new menu. Ate there on Friday night. The food is delicious and the service was great and super friendly. The place looks like a million bucks. Congratulations! Now its time to get the wine selection on par with the rest of all the hard work you’ve done. 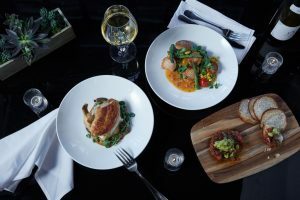 Wines seem generally substandard (vanilla-y reds and oak-y whites are no longer commensurate with the quality of the food you are serving) and seem as if they are off the old menu from the former Dog and Duck restaurant. One more thing, and I’m sure people won’t like this one: a wine pour IS NOT half a glass in an already big glass. Moderate the pour to a 35% to 40% full glass. It makes for a better experience, the wine tastes better, and people will order more! But Sunnyside is full of alcoholics so the big wine pours keeps ’em happy. Looks nice. Too bad I cant make it there since I am stranded on the other side of skillman because of the new bike lane wall. WONDERFUL, WONDERFUL!! The chef is amazing and knows how to cook. Great job guys!! These pictures are not even the “latest” in the design . It’s WAY better now . Was there last night . Food IS great , it’s def quality tasty food but I disagree with the statement that’s the portions are too small . I ate there with few male friends and nobody had a problem with the portion sizes . The place looks super and is a much needed improvement to Skillman Ave. The food is also so much better than the Dog and the Duck’s food was. Congratulations! Now Claret across the street needs to step up their game. I have eaten here twice. Excellent food, carefully prepared. Efficient and friendly service. A welcome addition to the neighborhood. I was there last night. The food was ok. Small portions. Just ok. Sidetracks wannabe. do they need a bus boy? El loco has experience and it will get him out of the apt and off of sunnysidepost, plus I need to start charging him rent now that I can’t find parking and must pay for a spot due to the stupid bike lanes. Seems to me it’s an advertisement and should be labeled as such. The fact that it’s clearly labeled “Sponsered Story” is good enough for me. Articles about changes and improvements at local bars and restaurants are newsworthy to local residents. They are very much a vital part of our community. This article provided me with news and as a result, I’ll stop in sometime soon and check it out. I certainly do not feel as if I was misled or deceived by an article that was really an ad. If I felt that way, I would just skip the next one that came along. Doesn’t “sponcered story “ mean advertising? I think the “sponsored” tag does not appear till you have already clicked through on the article. And it reads a bit like a PR puff piece. I also think other businesses have opened and have not got any reporting. We went there right after they took over and the food was superb. Goodluck! 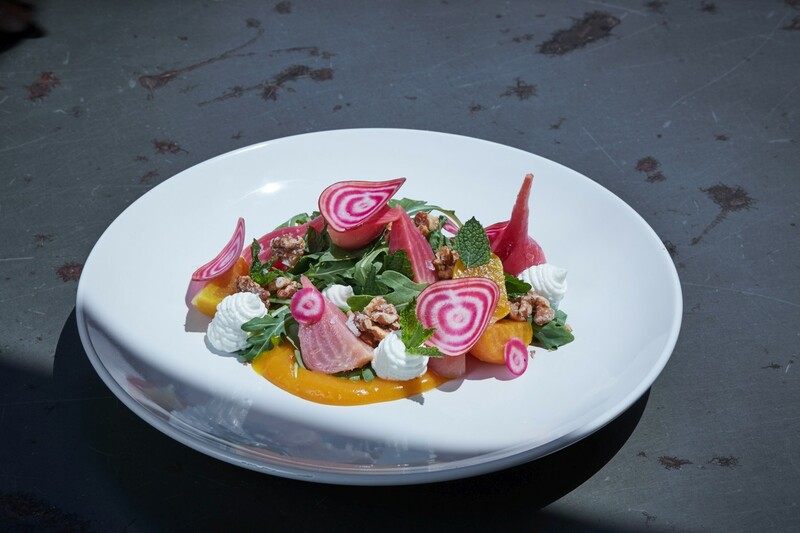 Can’t wait to try that beet salad good luck! James Dolan who owns the Knicks?!?? The food is way better than the old Dog and Duck. They can also make a good martini, at dinnertime, anyway. I think the brunch bartender is still . . . uh . . . learning. Good. The food wasn’t good at the D+D and prices were high. I’ll give the place a try.